The movie "Swiss Army Man," which was released on DVD earlier this month, opens with Hank (Paul Dano) alone on an island, standing on a crate with a noose around his neck. Then, he notices the dead body of Manny (Daniel Radcliffe) washed up on shore. Like a humanized version of Wilson from "Cast Away," Hank imagines that Manny is actually alive and having conversations with him. To me, this movie shows that we need other people. I can personally attest to this. At work, I was the first of my co-workers to move offices. So, for a month, I spent almost everyday alone in the office, sitting in my cubicle with no outside noise. I didn't have the buzz of co-workers talking or typing on their keyboards or people to say "Good morning" to. And I felt like I was going insane. We need human connection. We cannot do this life alone. For instance, did you know that studies show that human touch decreases disease and increases overall well being? One in four Americans report not having anyone to talk to about their personal problems. Social isolation could be tied to longer work days, further commutes, dependence on technology and lack of societal support to talk about emotions. But there's nothing wrong with asking for help or talking about how you feel. This doesn't make us weak. On the contrary, I believe it takes true strength to realize you need help and to not be afraid to open yourself up and ask for it. As Radcliffe's character says in the film, "If my best friend hides his farts from me then what else is he hiding," so should we stop hiding who we really are from the people we care about. Sure, having alone time is great. But it's also necessary to have a support system. And the world is missing out on a great human being if you don't let anyone see the real you. If you don't have anyone you feel comfortable talking to, there are 24-hour helplines you can call for help. In Michigan, call Common Ground at 800-231-1127. Nationwide, text "Go" to 741741 or call the National Suicide Prevention Lifeline at 1-800-273-8255. 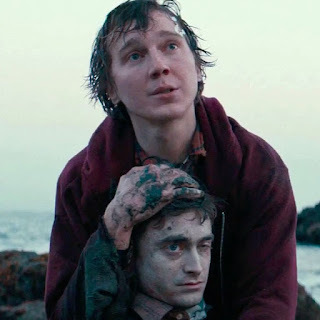 Swiss Army Man is a 2016 American comedy-drama film written and directed by Dan Kwan and Daniel Scheinert, starring Paul Dano, Daniel Radcliffe, and Mary Elizabeth Winstead. Such an amazing film. I really loved this movie.